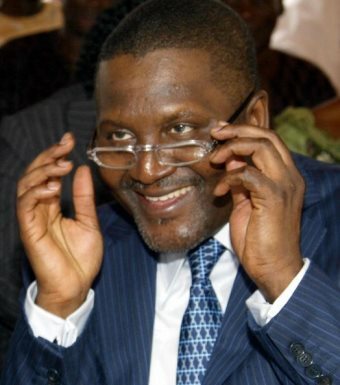 AFRICANGLOBE – Not satisfied with his 16 billion euro business empire, Africa’s richest man has said he now wants to buy Arsenal football club. Aliko Dangote pulled out of buying a stake in the London club four years ago but thinks the time will soon be right to secure a deal. The Nigerian businessman made his vast fortune from investing in sugar, cement, flour and oil, but Arsenal fans around the world want their owner to bring more than money to the table. The fans are allegedly questioning his motivations in taking on the famous team, with little sports investment in his wide business portfolio. The founder of fan club Arsenal Nigeria, Emeka Onyenuforo, told reporters that though Nigerians are proud to have Dangote representing their country’s interests on the world stage, people are “clamouring” for him to invest in Nigeria’s own football teams. Onyenuforo put his Arsenal club loyalty to one side for a moment to say “we have some fantastic clubs in the Nigerian League, but one thing they don’t have is the necessary financial capacity to restructure the team”. He did, however, admit that this was a rather uninviting investment prospect due to the rampant corruption in local and national teams. Corruption itself isn’t the only issue. Local teams find it increasingly hard to compete against the popularity of the iconic European clubs. Chiweshe said that now “most African teams cannot sustain themselves financially”, but not all investors are shying away from the challenge even if Africa’s richest man is not yet convinced.